Made for men & women - an everyday, easier to put on compression sock with 15-20 mmHg true gradient compression designed to improve circulation, relieve tired, heavy, aching legs and prevent mild swelling. 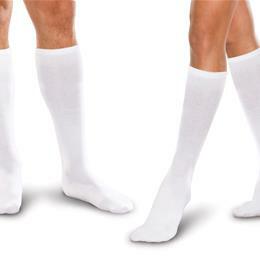 Soft, ultra stretchy fibers ensure these compression socks are easier to put on and more comfortable to wear. 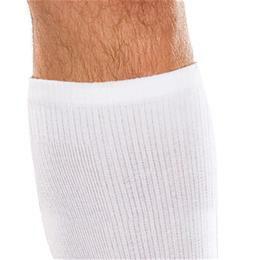 Non-binding, knit-in band that holds the socks in place all day. Features comfort heel and toe. Cotton/microfiber blend. Black and Navy colors contain X-STATIC silver fibers for moisture wicking. 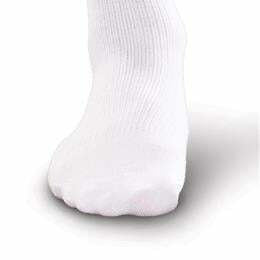 All other colors have the patented Micro-Cool process which wicks away moisture, providing a comfortable coolness. Made 100% in the USA. Be sure to use the size chart and measuring instructions to determine best size and fit. Care: Hand wash in lukewarm or cold water with mild detergent. Avoid prolonged exposure to heat.